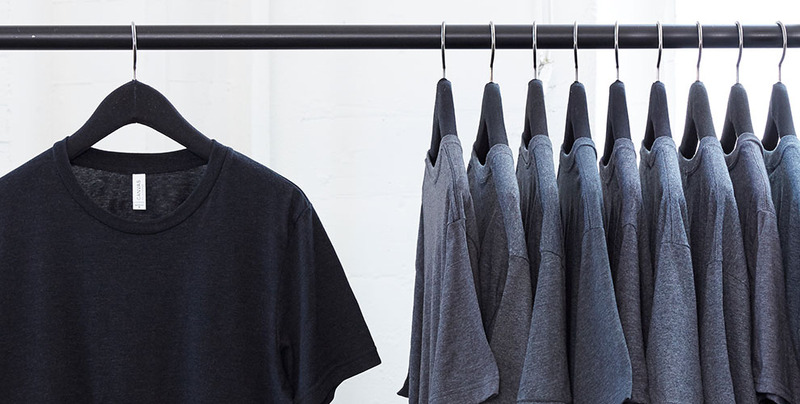 Choosing the best blank garments can make or break your business. For real. A good supplier will provide the foundation and support you need to grow, and a bad one will lead you down an endless road of headaches due to spotty inventory and quality issues. Here are a few super important factors to keep in mind when choosing the best blank garments to use. This one may seem a given, but the most important thing to look for when choosing your supplier is quality. Just remember–NOT ALL TEES ARE CREATED EQUAL. There are various types of yarn and different types of construction details that factor into the feel and fit of a garment. For a garment that will be worn on repeat, make sure you’re are picking a fabric that uses 100% combed and ring-spun cotton and side-seamed construction. Learn more about the different details to look for in a shirt here. Another thing to look for is the assortment of styles. Stick to a supplier who has everything you are looking for–whether it’s men’s, women’s or kids. We promise, being monogamous will make your life easier in the long run. This is so important, especially with DTG, which is largely a made-to-order business. You want a supplier you can rely on so you are able to test the market without holding a ton of inventory. Part of the appeal of DTG printing is that you don’t have to guess how well a t-shirt will sell. You can test the market first and then order proven styles when you see something going fast. To make this work for you, you need a supplier who has consistent inventory who can get product into your hands quickly. BELLA+CANVAS has over 70 million blanks, stocked and ready to ship, in over 25 cities across the country because we know the importance of reliable inventory for any successful t-shirt business. We try to be as transparent as possible by giving customers the ability to view our inventory on our website, and if a product is not in stock, you can view expected arrival dates, get reminder emails or use our product locator to track down any style at one of our distributors! Most people starting out don’t realize how frequently they’ll need to be in touch with a supplier. A great customer service rep will be your right-hand man for your business. You will rely on your supplier for all sorts of things—product recommendations, order support, marketing and design ideas, so it’s crucial this salesperson understands your business and can give you the advice you need. At BELLA+CANVAS, we get it. We want to give you as many tools as possible to make your business a success, which is why we’ve invested in resources like live chat, an image gallery where you can download images and use them as your own, blog and video content you can turn to for inspiration, and the list goes on! We get to hear a lot of customer success stories in our line of work—and its one of the most rewarding parts of the job! One of the most inspiring stories comes from a company called TICDA, a father/daughter company that has grown like wildfire, attracting celebrity endorsements from the likes of Marc Wahlberg, and has fueled a movement with their slogan “Today I Can Do Anything.” We partnered up with them for a series on YouTube about 3 Keys to Success when starting a T-shirt line. Check out the series here and subscribe!